Vatican City, Apr 25, 2014 / 05:02 pm (CNA/EWTN News).- Cardinals Loris Capovilla and Stanislaw Dziwisz, who were personal secretaries to John XXIII and John Paul II, spoke at a news conference Friday of the clear sanctity of both Popes. Recalling the final days of Bl. John XXIII’s life, Cardinal Capovilla, said April 25 that as the Pope lay on his deathbed, he said, trying to comfort him, that while there were but a few persons in the room, the square below was full of people praying for him. Cardinal Dziwisz then recounted his 12 years in Krakow as Wojtyla’s secretary, and his service throughout his pontificate. 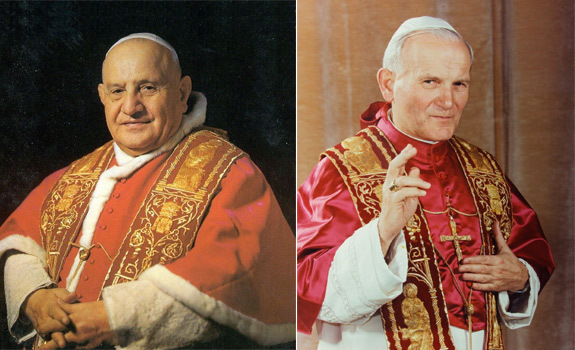 Discussing Wojtyla’s favored means of prayer, he mentioned Adoration, the Way of the Cross, devotion to the Holy Spirit which was fostered by his father, and a Christological rosary focusing on Mary’s role with her Son. Another strong aspect of John Paul II’s holiness was that of suffering, the cardinal noted, highlighting how the Pope’s whole life was marked by pain, beginning with the death of his family members as a young man, his attempted assassination, and finally his contraction of Parkinson’s disease.